Felix, from London has been coming to XUK Activity for the past two years with his younger sister. Felix loves XUK just as much as we do and looks forward to being reunited with his friends every summer! We asked Felix to tell us about a day at camp… We would say an ‘average day’ but every day is different at our camps! “In the morning, you are woken up by your dorm leader and if you’re me, your dorm mates will be trying to wake you up too! After getting dressed and sorting out my hair, I head to the main house to have breakfast. I’m feeling a bit sleepy this morning – I gazed at the star through my window last night! For breakfast, there is always a hot option (pancakes, full English breakfast or my favourite, Belgian Waffles) as well as cereal and fruit. The dining hall and the picnic grounds outside are perfect places to meet new people as well as hear Richard sing. Breakfast takes you out of 'sleepy' mode and into 'ready for XUK mode'. Once I have finished my breakfast I’ll head down to the common rooms for some free time with my friends. After a bit of table tennis, along with the other Juniors and Inters we are registered and go to Activity 1. The teens are responsible for making their own way over to their activities.Today, the first session is a Choice Session. This means that campers get a chance to choose what they would like to spend the session doing. The activity group with the most ‘Championship Points’ will get the privilege of choosing first. Usually, there is an arty activity and a sporty activity as well as a relaxing activity. This time there is swimming, cooking or nature walk. So I will choose to go on the nature walk as it is very interesting. As the school was built before World War Two there are still air raid shelters in the forest. These are perfectly safe to go in when supervised and fun to have a taste of what the British blitz was like. Activity 2 is Mad Science. In this activity, you can make vinegar and baking soda volcanoes or your own sticky slime. Sometimes the volcanoes go everywhere but it’s great fun. After the activity, it is time for lunch. A necessary addition to the day to restock on energy for the afternoon! After some free time, we are registered again for Activity 3. I have Outward Bounds, one of my favourites. The instructors show us how to fit helmets and harnesses before moving onto apparatus. First up is Jacob's Ladder, a supersized ladder where the gaps get larger the higher you get. And it wriggles about when you try to move. We work as a team, helping each other onto the next step. Next is Crate Stacking. A competition to see who can stack the most crates which will win you 15 ‘Championship Points’! Also, you can try the Leap of Faith. This involves climbing up a skinny pole before jumping off and trying to grab onto a hanging bar. Our session finished with the climbing wall. You may even try it blindfolded, using your teammates and your hands to search. A good way to search for rocks is to dab everywhere and eventually you will find one! After an exhausting two and a half hours of climbing, jumping and stacking, it is time for dinner. Everyone's favourite dinner is the barbeque, we are very lucky and have two a week. You can choose from burgers and hot dogs to vegetarian options such as veggie burgers. For pudding we have fruit and ice lollies! Tonight, we have my one of the best evening activities agreed by many staff members and campers… the talent show and disco. There is so much talent from around the globe ranging from beatboxing to dancing! Afterwards is the awards ceremony. 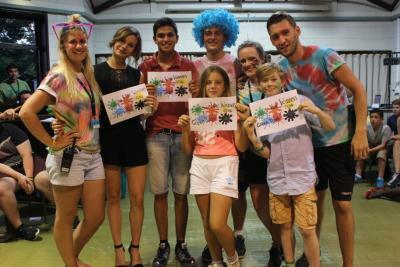 There are prizes for the Activity Group with the most ‘Championship Points’ and the famous ‘Citizen of the Week’ award which goes to the camper that the staff think has been an all-around pleasure to have at camp.We finish the day with a disco, dancing to our favourite songs! Thank you for your time Felix, we hope to see you at XUK in 2017!